Life has a way of breaking our hearts from time to time. Mine’s been broken plenty and I’m sure yours has too. Some researchers believe that, besides bringing on a lot of misery, in extreme cases a broken heart can have decidedly deadly consequences. Psychologists and medical doctors continue to study whether people can actually die from a so-called broken heart and while there are no definitive answers, there is an ailment known as “broken heart syndrome”—also called stress cardiomyopathy—that can lead to severe cardiac problems and even death. Deep sorrow brought on, say, by the passing of a loved one is believed to cause such tremendous stress in some cases that it triggers mechanical failures of the body. This syndrome can also be elicited by trauma such as a car accident or by indignities or deep distress. When these types of emotional peaks occur, our bodies unleash chemicals, including adrenaline, that can stun the heart muscle and disrupt its pumping mechanism. While cases of death by heartbreak are rare, the latest research from the World Health Organization shows that 17.5 million people died from cardiovascular diseases globally in 2012; this represents 31 percent of all deaths. In the United States alone the total medical costs of cardiovascular disease will reach $818.1 billion over the next three decades, according to a report called “Forecasting the Future of Cardiovascular Disease,” published by the American Heart Association. To help stem the tide of cardiovascular disease, a multidisciplinary team of heart experts has launched the Living Heart project, which represents the next frontier in diagnosing, treating, and preventing heart conditions with the use of personalized, three-dimensional virtual models. In our cover story this month, associate editor Alan Brown takes us on an interesting journey examining the fascinating way this project originated. 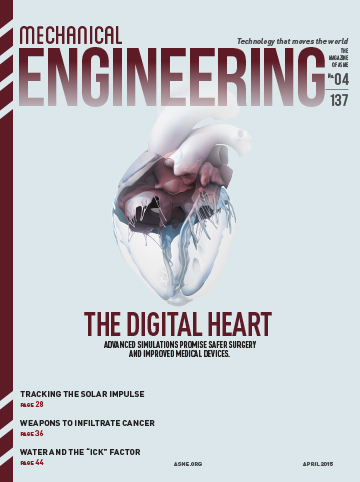 At the core of the project is Dassault Systèmes’ Simulia software, which is used to render a 3-D model that captures the electrical and mechanical behavior of the heart in a realistic manner. By using input from echocardiograms, MRIs, and CT scans, along with other cardiac data, the Living Heart project has created in virtual reality a representation of chambers, movements, and sounds reflecting the behavior of a human heart. Doctors can maneuver this simulation to reveal detailed behavior of the heart without resorting to invasive diagnostics. Even though the developers working on the Living Heart make no promise that they will be able to mend a “broken heart,” this simulation tool does have the potential to open the door for more research on cardiovascular illnesses, as well as to accelerate regulatory approval cycles for personalized devices and improve patient diagnoses and care. Besides focusing on the heart in this issue, we also feature a fascinating essay by renowned biomedical and nanotechnology expert—and mechanical engineer—Mauro Ferrari, who discusses how nanomechanics is opening new avenues in the treatment war against metastatic cancer. good your chosen film by viewing it on vidmate , this is usually the basic process to download the app abide by the guidelines to mount vidmate on your laptop.nice. good You can follow above graphic and perform the same factor in your Bluestacks. Thus click on search choice in Bluestacks application.nice. good It is definitely similarly famous in both the parents and the kids and its level of popularity is certainly elevating moment by moment.nice. good Pokemon Head out will build a Parallel Shape as ours but with Pokemons by making use of your smartphone. You can turn between the size with PowerPortals. nice. good Mobdro allows you to see no cost live comfortably Tv set channels from practically everywhere. In this content, I will demonstrate you how to mount Mobdro on Android Tv set field. nice. good it is utilized in around 100 nations around the globe. it has over.Every day around 25 million android applications are downloaded via 9apps.9 applications gives cost-free android applications	great. Great Mobdro COMPUTER Download and install Free, Mobdro Windows 8, Mobdro on Windows 10, Mobdro Free Video clip Streaming App. Fine. good You can take a video clip of yourself lip syncing on the application or import one. Regardless the impacts to fix up your performance are awaiting	nice.